A glorious sunny day in Devon saw the running of the 2016 National Team Time Trial Championships, hosted by Mid-Devon Cycling Club on behalf of Cycling Time Trials (CTT). The course was a challenging 32-miles of hilly Devon countryside. Several top teams from around the country descended on Hatherleigh in an attempt to lay claim to the national title. Local teams were also well represented this year, with Devon and Cornwall clubs rubbing shoulders with the best in the business. Pedal Heaven took the men’s title – Lloyd Chapman, Joseph Fry and Max Steadman with a time of 1:07.40. SSLL RT took second place, with Andy Jackson, Alastair Wareham and Jonathan Wears. They finished less than a minute down in 1:08.19. Team Bottrill completed the podium with John Dewey, Jonathan Parker and Matthew Smith coming home in 1:09.39. In the Womens championships, Chester Road Club’s Jill Wilkinson, Gina Riley and Rebecca Holland took the top spot with a time of 1:22.16. Revo Racing’s Liam Bard, Harry Edney and Matt Slater came high in the rankings with 8th overall and a time of 1:13:17. They also had the honour of bringing home the 1st place medal for the fastest South West Team. 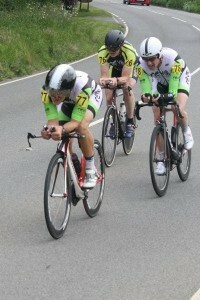 The 2nd South West Team and 11th overall were Mark Coombe, Mike Gratton and James Tribble from Mid Devon CC. 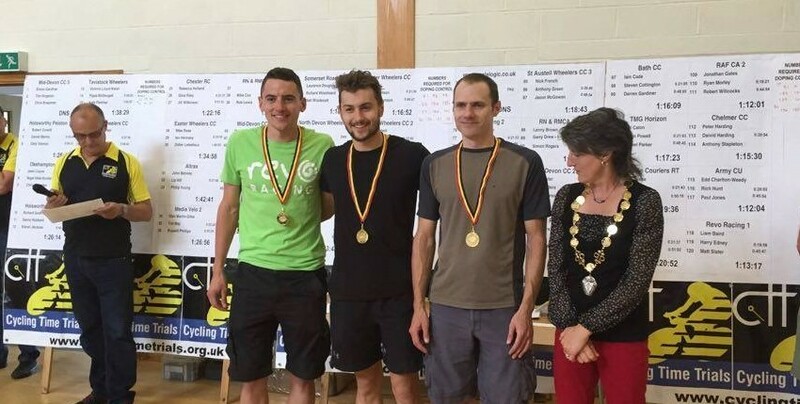 The 3rd South West Team and 12th overall were also from Mid Devon; Tony Foster, Lee Sanderson and Mark Sanders. Revo Racing’s Richard Babbage, Nick Harwood and Tim Heal (pictured left) finished 19th overall with a time of 1:20:23.